Description: V-TACLPC swings thru Victory WI on a foggy Sunday morning. Description: The foggy is slowly disapatting along the Mississippi River as the V-TACLPC flies by. Description: NS 55T starts climbing up grade after crossing the Sangamon River at Riverton. Run-thru BNSF power is very common on this train. Description: On EB NS train 55T. Description: BNSF 7364 leads a mile of container cargo east of Newton. Description: NS Northbound Empty Amry Tank Train 056 passing through 20th Street in Irondale, AL. Description: NS Northbound Empty Amry Tank Train 056 passing through Irondale, AL. Description: Passing through Kansas City Union Station is BNSF Train Z-WSPKCK9-27A with a short line of hot stacks and COFC. 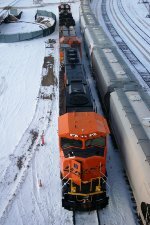 Title: BNSF 7208 rolls a stack train to a stop.. Description: This WB stack would crawl past me and stop to let 2 WB Z's run around them. Description: BNSF 7208 in dense fog, but almost close enough to the camera to get a clear picture. Description: BNSF 7208 lays over at Fairburn on January 7, 2018.